When you are asleep or out of the house, turn your thermostat back 10° to 15° for eight hours. A smart or programmable thermostat can make it easy to set back your temperature. Keep your fireplace damper closed unless a fire is burning. Keeping the damper open is like leaving a window wide open during the winter; it allows warm air to go right up the chimney. Reduce the temperature of your water heater to the warm setting (120°F). You’ll not only save energy, you’ll avoid scalding your hands. And you’ll leave more water for extra visitors during the holidays! Keep vents and radiators clear. Not only is dust an allergen, it is a wonderful insulator. Clean the built-up dust from your radiators and baseboard heat vents often. This allows the air to flow freely into your rooms and promotes equal heat radiation. It is healthier too! Pay attention to your windows. Approximately 10-25% of your house’s heat loss can be attributed to windows. To reduce this, open curtains and shades on south facing windows during daylight hours to allow the sun’s heat to enter your house and warm it. Keep curtains and blinds closed at night and when the sun is not shining on them to insulate your house and keep the heat inside. Another tip – place blankets over uncovered windows and drapes, especially at night when the windows are not being used and the temperature is at its coldest. While saving on your monthly energy bill is important, safety and security are the top priority. Be sure to give your home that lived-in look while you’re away by using programmable timers that allow you to manage which lights to turn on, when and for how long while you’re away from home. Enjoy your holidays! As always, call Kay Heating and Air Conditioning for any needs that arise during this busy season. 336-274-6323 or contact us at www.kayheating.com. As the temperatures start to rise, you may be looking forward to the extra sun but dreading the spike in your electricity bill. WalletHub® calculated that North Carolinians had the eleventh highest average electricity bills in 2017 – $144 per month – compared to residents in all other states and Washington D.C.1 Over the course of a year, that can really add up! While you don’t have control over utility prices, you can reduce your energy consumption and lower your bills in an unlikely way. We already know intuitively that trees lower the temperature; it’s why we prefer to stand under a tree on a sweltering summer day than directly in the path of the sun’s brutal rays. There are two main reasons for this cooling effect. • Shading – Tree leaves can block sunlight from hitting your home and streaming in through your windows. • Evapotranspiration – This is a combination of evaporation and transpiration, two major parts of the water cycle. Evaporation is the transformation of liquid water into water vapor after heating. Transpiration is the process by which water moves from the ground up through a tree’s roots and is released through the leaves’ stoma to become vapor. In general, it’s a good idea to choose trees that are compatible with the climate of your state and the microclimate of your town. North Carolina is in a temperate region of the United States, so you will want to plant shade trees that are native to the area and can survive in the region’s climate and with the annual rainfall. You will also need to decide between planting deciduous or evergreen trees. The main difference is that deciduous trees will lose their leaves in fall and be barren in winter, whereas evergreen trees remain lush and full year-round. While this doesn’t make much of a difference during spring and summer, an evergreen tree will also block sunlight during the fall and winter, which you may not want. For instance, you may want to offset winter heating costs by allowing sunlight to hit your home. When it comes to the deciduous versus evergreen debate, there is no right or wrong answer. Choose the tree that will give you your desired shade for every season. To check what trees may be appropriate for your home, reference the native plant list provided by NC State University or one of the plant lists provided by the Natural Learning Initiative at the NC State College of Design. • Keep sun and shade angle in mind – Even if you plant your tree right next to your home, it might not provide shade at the time of day you want, if at all. In general, plant trees with lower crowns on the west side of the house to block afternoon and sunset rays. Tall deciduous trees with high crowns are better suited for the southern side of the house, unless you have solar panels or rely on winter sun to heat your home. When in doubt, ask a landscaping professional. • Watch out for roots – Make sure you know how large the root system of your tree will be once it’s fully matured. Overgrown roots can destroy a home’s foundation or your driveway. You may also accidentally plant trees too close to each other, stifling their ability to grow. • Give your house some room to breathe – While you want shade, you also don’t want to damage your home. How far you plant your tree from the house will depend on the species and your homeowners insurance policy. • Maximize curb appeal – There is an art to landscaping. If you space trees out haphazardly, they may reduce the curb appeal of your home or cause damage. Consult with a tree service company if you don’t have much landscaping experience. Save Money on Your Bills With Kay Heating & Air Conditioning, Inc. 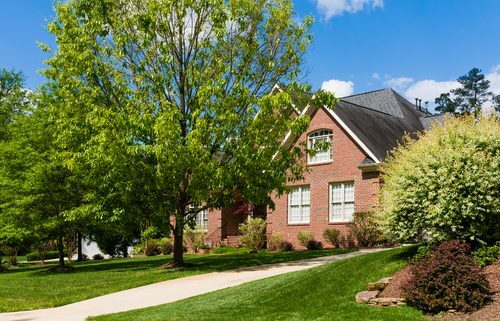 While shade trees are a great way to boost your home’s energy efficiency, it’s more important that your HVAC system is running smoothly. If your air filter is dirty or the system’s parts are worn down, your A/C has to work twice as hard to pump cool air into your home, driving up your energy bill every month and potentially causing costly damage to the unit! At Kay Heating & Air Conditioning, Inc., our CFC-certified technicians can take care of any HVAC tune-up or repair. We’ve been serving North Carolina since 1972, so we know HVAC systems inside and out. If you’re in the Triad area, give us a call at 336-274-6323 to schedule your service today!